Having a beautiful smile is a trait almost everyone strives to achieve. From brushing twice daily to always remembering to floss, there are many different ways people attempt to create and maintain a beautiful smile. However, accidents, tooth decay, and gum disease can all results in a loss of teeth. Instead of being embarrassed or afraid to show your teeth, those interested in getting dentures can reach out to Irvington Dental Group. Specializing in denture services for people of all ages, we are able to help create a beautiful smile for anyone. We know that a lot of people suffer from the fear of the dentist and we make it a priority to make sure our patients are as comfortable as possible when visiting us for any kind of service. We practice the highest standards and practices in the dental industry to provide the best service possible to our patients. Residents and families across East Orange, Newark and Irvington, NJ have trusted us with all of their dental needs for years. Anyone who is sick of feeling embarrassed because of any missing teeth doesn’t have to feel that way much longer. 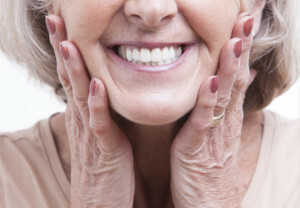 Getting a custom fit of dentures to wear can do a lot to positively impact someone’s life. From boosting confidence to being able to eat and process food easier, dentures can make life easier. The added level of care we show each patient will help create both a positive connection between doctor and patient. As we hinted at earlier, even the most naturally beautiful people can find themselves self-conscious following the loss of any teeth. Partial and full dentures can help boost anyone’s self-confidence. Making sure our patients feel comfortable enough to have no worries smiling in their new dentures is our biggest priority when fitting someone for full or partial dentures. Aside from helping restore someone’s smile, full or partial dentures can also help eliminate any dietary restrictions that can be put in place due to missing teeth. Solid foods can be much more difficult to eat and enjoy for anyone with missing teeth. Having a full set of teeth gives the freedom to enjoy many foods that may otherwise be difficult without full or partial dentures. Another issue that can arise from a lack of teeth is having trouble pronouncing certain sounds or words. Custom-fit full or partial dentures can give you the freedom to correctly pronounce any word again. Those in need of full or partial dentures from a quality dentist have come to the right place. Aside from offering up dentures, Irvington Dental Group is also a reliable provider of emergency dental services. Give us a call today at 973-453-9088 to get started creating the perfect smile.